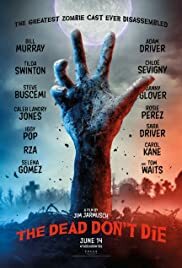 Director: Jim JarmuschWriters: Jim JarmuschStars: ChloÃ« Sevigny, Adam Driver, Tilda SwintonSummary: The peaceful town of Centerville finds itself battling a zombie horde as the dead start rising from their graves. The Dead Don't Die is an upcoming American zombie horror comedy film, written and directed by Jim Jarmusch. It stars Adam Driver, Bill Murray, Selena Gomez, Chloë Sevigny, Steve Buscemi, Austin Butler, RZA, Tilda Swinton, Tom Waits, Danny Glover, Caleb Landry Jones, Rosie Perez and Carol Kane. It is scheduled to be released on June 14, 2019, by Focus Features. This entry was posted	on Thursday, April 4th, 2019 at 4:23 pm	and is filed under Horror, Movie List, Movie Trailer, Movies, Tales from the Light Side, Trailers. You can follow any responses to this entry through the RSS 2.0 feed. You can leave a response, or trackback from your own site.